SAN DIEGO, Calif.—Roger Ogden, the founder and leading organizer of the activist group Stop Obama Now—San Diego, is easily one of the nation’s most dedicated, determined and hardest-working activists out there today. This reporter has been paying close attention to Mr. Ogden’s activist group, its protests, and YouTube videos, which have featured major demonstrations and public protests all across Southern California, particularly in San Diego County, for well over a year now. 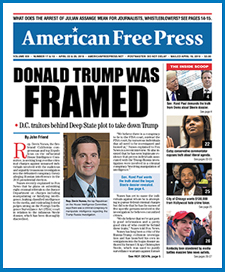 AMERICAN FREE PRESS recently spoke with Mr. Ogden to gain a deeper understanding of what motivates him, and to learn more about his organization and past and upcoming protests. Reflecting the views of many patriotic Americans—including tea party supporters, disillusioned liberals and other independent, populist-minded Americans across the political spectrum—Ogden believes Obama is not eligible to hold the presidency, much less fit for office given his mysterious background and self-professed radical influences. Obama’s dubious origins and his alleged birth certificate, publicly released by his administration as a result of pressure from conservative-leaning groups who questioned his American citizenship, also disturbed Ogden well after his suspicions of the president were already established. Ogden believes that the most pressing problem facing America today is the fact that “we have an illegitimate and erratic anti-American president who appears to have rather serious psychological issues.” Ideally, Ogden would like to see Obama impeached, but he admits that an impeachment alone would not solve all of America’s problems. However, impeachment “would be a great first step in the direction of a return to the rule of law,” Ogden opined. The numerous public protests the group has organized and participated in have been quite successful according to Ogden, who believes that his message is gaining traction. Many of the protests organized by Ogden have received attention from local media outlets in Southern California and, of course, many alternative media outlets, blogs and social media sites have covered and reported on the demonstrations as well. In early May, Ogden and his group organized a major protest in La Jolla, Calif., a wealthy enclave in San Diego, outside an Obama fundraising event at the home of Irwin Jacobs, a top contributor to and fundraiser for the Democratic Party. This past weekend, Ogden and his group are participating in what will surely be yet another major protest outside of Angels Stadium in Irvine, Calif., where Obama will be delivering the keynote speech at the commencement ceremony for the graduating class of UC-Irvine. “We are encouraging the start-up of independent, volunteer protest groups across the nation,” Ogden explained. “The protests need to grow to a point that they can no longer be ignored by the national media.” Ogden has set up a website to help support independent protest groups and publicize their events and activism. Growing movement? Have you seen any of the “crowds” of five or eight or even one that are turning out for the Impeach Obama Week “demonstrations” around the country. This is pathetic, and you are delusional.